ROME (AP) — Renata Tebaldi, an Italian soprano renowned for her angelic voice, her stardom at New York's Metropolitan and Italy's La Scala and her media-fueled rivalry with Maria Callas, died Sunday at age 82. The opera singer died at her home in San Marino, a tiny, independent republic in north-central Italy, after a long illness, said her doctor, Dr. Niksa Simetovic. Tebaldi was considered to have one of the most beautiful Italian voices of the 20th century, relying on rich, perfectly produced tones. The late conductor Arturo Toscanini once said she had "the voice of an angel." "Farewell, Renata, your memory and your voice will be etched on my heart forever," tenor Luciano Pavarotti said Sunday, quoted by the ANSA news agency. La Scala music director Riccardo Muti praised Tebaldi as "one of the greatest performers with one of the most extraordinary voices in the field of opera." 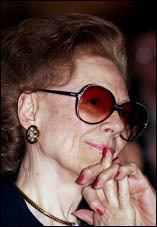 At Venice's La Fenice theater, the audience observed a minute of silence in her memory. Tebaldi, who was at her peak in the 1950s, was recalled for her renditions of Puccini and Verdi with a voice praised for its purity of timbre and exceptional range of color and shadings. For years, opera fans devoured details of what they perceived as a prima donna duel between Tebaldi and Callas, and La Scala devotees were divided into two camps much as Milan's soccer fans are hotly split over the city's two soccer teams. But much of the supposed rivalry with the Greek-American diva was actually whipped up by the media. After her retirement, Tebaldi told an interviewer she had never considered fiery Callas a rival. Tebaldi was born on Feb. 1, 1922, in Pesaro, the Adriatic resort that is the birthplace of composer Gioacchino Rossini and the host of summer music concerts. After recovering from polio, contracted when she was 3, she studied at that town's conservatory and at the conservatory of Parma. Tebaldi made her debut in 1944 as Elena in Boito's "Mefistofele" in the northern Italian town of Rovigo. Soon after, she began performing in some of the world's most noted opera houses and sang in a concert of arias conducted by Toscanini at the 1946 reopening of Milan's La Scala, which had been damaged by World War II bombs. She made her London debut at Covent Garden as Desdemona in "Otello," on the opening night of the Scala company's London season in 1950, and returned to London in 1955 to sing Tosca. Her American debut was in San Francisco in 1950 as Aida. She made her Met debut as Desdemona on Jan. 31, 1955, and that was also her final role there, on Jan. 8, 1973. As early as 1950, Callas' competitive attitude toward Tebaldi, the then-reigning prima donna at La Scala, had already begun. When Tebaldi did not quite succeed in her first "La Traviata" at the Milan theater, Callas called her a "poor thing." When asked about the supposed feud, Callas said simply they were friendly but were very different as singers. In 1968, when Tebaldi sang a Met opening-night "Adriana Lecouvreur," Callas visited the Italian backstage after the performance. A photo taken at the time shows the two women embracing warmly. Callas' husband, Giovanni Battista Meneghini, once suggested the "feud" was a cynical move to boost record sales, with both divas playing along. Tebaldi never married. A memorial service will be held Tuesday in San Marino, her doctor said, and another memorial will likely also be planned in Milan.